Sneyd's utilises 30 years of experience in pet nutrition to produce the highest quality foods for dogs of all ages, sizes and breeds. The Wonderdog brand includes the Gold, Original and Special diets for working dogs, with fortified vitamins and minerals, cod liver oil and advanced chondroitin and glucosamine for joint lubrication and support. Sneyd's Gold is a complete diet enriched with digestible weetsweet and containing cooked cereals, real meat and meat derivatives, oils and balanced fats for a nutritionally tailored meal. The Original diet is free from all ingredients known to cause allergies and exacerbate digestive sensitivities, including wheat, dairy, beef and soya. It also contains no artificial ingredients such as colours, flavours or preservatives so you can be assured your dog is receiving the very best in dietary care. The diet combines a wholesome blend of chicken and fish meal, whole grain rice, yeasts, linseed and beet pulp to nourish and protect your dog from the inside out, supporting internal systems and improving the condition of your dog's skin and coat. Cereals, Meat and Animal Derivatives (minimum 4% meaty chunks), Derivatives of Vegetable Origin, Various Sugars, Oils and Fats (0.25% cod liver oil), Vegetables, Minerals, Vegetable Protein Extracts. Cereals, Meat and Animal Derivatives (minimum 4% meaty chunks), Derivatives of Vegetable Origin, Oils and Fats (0.25% cod liver oil), Various Sugars, Vegetable Protein Extracts, Minerals. Colourants, Antioxidants, Preservatives. Nutritional Additives / Kg. Vitamins: Vitamin A 13,600i.u., Vitamin D3 1,200i.u., Vitamin E 56mg. Trace Elements: Calcium Iodate Anhydrous 3.2mg, Sodium Selenite 0.2mg, Cupric Sulphate Pentahydrate 25mg, Ferrous Sulphate Monohydrate 160mg, Manganous Oxide 65mg, Zinc Oxide 111mg. 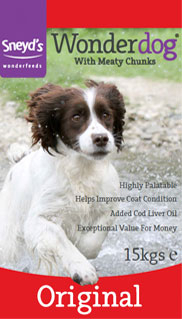 There are currently no questions for Sneyd's Wonderdog Dog Food - be the first to ask one!